Whether it's your love for theatre, professional ambition, or calling to teach that has brought you here, we will guide you into becoming a well-rounded theatre practitioner committed to artistic and academic excellence. After all, our world needs smart artists. So we start with foundational instruction on all theatrical aspects that streamline into more specific courses each year. You'll have the chance to take part in departmental productions and in the Nashville theatre scene, too. Our professional faculty will connect you to outside opportunities. You'll build community in our tight-knit department, where support from the relationships you gain here will keep strengthening your career even after graduation day. Learn about the audition process for our BFA degrees in the Admissions Requirements tab above. We created the Theatre BFA for students who want to dedicate themselves to a specific theatrical area. Acting, designing, directing and musical theatre all have a foundation of courses that split into specific concentrations as you train. The BFA is best for those going straight into the professional theatre industry or graduate school for an MFA. Our Theatre BA gives a broad foundation in general theatre courses with electives available for specific development in an area such as acting, directing or designing. It is easily paired with other degrees, creating a symbiotic relationship for those wishing to double major. Our BA in Theatre teaching is for those who love theatre and also feel called into teaching. In this degree, students study both theatre and education courses, receiving their licensure in teaching by graduation. Students must audition and interview for admittance into the BFA program and maintain a 2.5 GPA. BA students are not required to audition/interview. Please prepare 16 bars of a Broadway style song and a 60-second monologue that showcases your abilities as a performer. We recommend a contemporary monologue (not from a musical) in a character close to you in age range. Please bring your sheet music marked and ready for the accompanist. Dance call for musical theatre applicants is 9:00 am on the date listed. Remember to bring four copies of your headshot and resume with you. Please affix your resume to the back of your headshot. Please prepare two contrasting, 60-second monologues (not from musicals, please). We recommend that you select characters close to you in age range. No vocal audition or dance call will be required for this audition. Remember to bring four copies of your headshot and resume with you. Please affix your resume to the back of your headshot. Please prepare a portfolio and four copies of your resume. Email nemcintyre@lipscomb.edu to sign up for a time or to ask questions about the audition/interview process. We would love to see any work representative of your design and/or directing experience, including (but not required) research, script analysis, renderings, and/or photos of the work. NOTE: Dance call for Musical Theatre majors will be at 9:00 am each audition date. Also, if you are in town for any of the show weekends, please email nat.mcintyre@lipscomb.edu for prospective student tickets. Note: Must complete prescribed minor in Musical Theatre (See School of Music). Theatre majors may also choose to minor in theatre by choosing from the areas below, or they may seek approval of a course of study designed specifically for their interests. 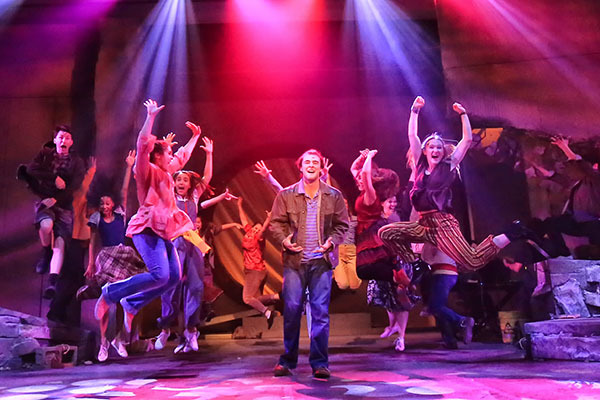 Theatre scholarships are offered as a one-year scholarship to BFA candidates. Your audition for acceptance to the BFA program of your choice (Musical Theatre, Acting, Directing, Design) is also your scholarship audition. There are opportunities for scholarships for upperclassmen in the theatre department. These are applied for in the spring of each year, and are considered work scholarships in the department. Workstudy positions are also available. All offered scholarships must be confirmed and accepted before April 15, 2019, or they will be offered to the next candidate. Click on one of the audition dates below to fill out a request to be seen form.